Astounded is the word! Astounded I was to find that a brand new, automatic winding mechanical watch with leather strap was available for purchase at a price, including postage and packing, of less than ten British Pounds. One wonders what an item of such precision manufacturing would have cost, say, two hundred years ago. Probably in the region of ten British Pounds. There's one slight drawback, a curse of the modern age. Many a day is now spent merely sitting in an office in front of a computer, which for most of us, does not generate enough wrist action to keep the watch fully wound. This is however a problem which has already been solved: watch winders. Watch winders consist of a pedestal onto which one places the timekeeper, where it is gently rotated, at an angle, continuously. This has never struck me as a particularly elegant solution. And in this day and age, where all kinds of digital gadgetry are afforded the luxury of inductive charging, doesn't the market for inductive winding of automatic mechanical watches seem woefully underexploited? Thus, mitxela's Inductive Automatic Watch Winder is born. The unobtrusive (possibly teak) pad generates a rotating magnetic field to drive the weight in gentle circles as if by magic. 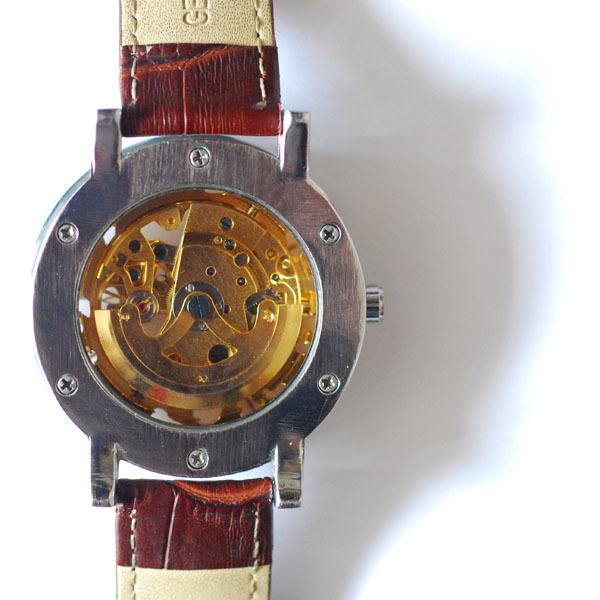 Underside of the watch. The winding counterweight is exposed. How ferrous is the weight of the automatic winder? Would it need augmenting? How ferrous is the rest of the watch? Hopefully the magnetic field wouldn't interfere with timekeeping. One possible solution would be to rotate the field at a certain harmonic of the balance wheel's motion. This may or may not work. Would the watch remain magnetized? Not if the field is reduced gradually while still rotating. How gradually? Maybe this would warrant an 'off' switch to control it. It would be ideal if this could work with any automatic mechanical watch, however I suspect watches would have to be especially designed with the Inductive Automatic Watch Winder in mind.